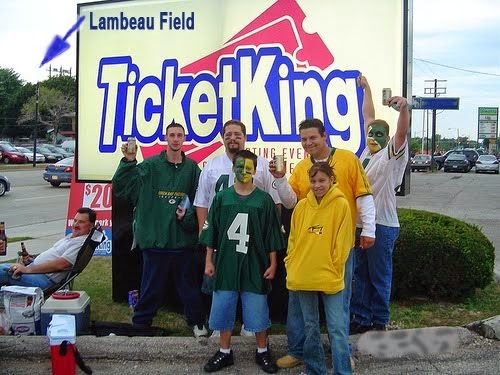 With the Green Bay Packers being sold out for years to come, the best way to obtain 2014 tickets is to use a trusted ticket broker. Ticket King can get you in the game, on the road or at home. We're members of the BBB and NATB, and Packers tickets are what we do. Green Bay opens the season on the road, at Seattle. The Seahawks are coming off their Super Bowl victory, and you can bet that this is one of the biggest games for both teams, right out of the box. Green Bay fans haven't forgotten the "catch-no catch" call from the strike season, and this is the first game where the Packers have the chance to bury that bad old memory. The game is set for September 4, and all eyes will be on two of the best quarterbacks in the NFL. The Packers host the New York Jets on September 14, and it's the afternoon game on CBS. Green Bay will be fresh off a nine day break, since the opening game is on a Thursday night. The Jets are coming off of a .500 season, Rex Ryan is still at the helm, and they have the Patriots in their sites, but first they have to play all three NFC North teams, then take on the Chargers and Broncos. Their first test will be a game at home against the Raiders, then it's off to Lambeau Field to play the Packers. You can bet that if Green Bay loses their opener, they will be frothing at the mouth to get a win at home against New York. Packers versus Lions: The Lions will play host in Green Bay's first NFC North match up of 2014. The date is set for September 21, and kickoff is at noon. The Lions said goodbye to their head coach, thinking that he didn't utilize the talent that was handed to him. With the Lions, you never know what you are going to get. At home, they have managed to defeat Green Bay five times since 2000. On the road, they haven't won a game against the Packers in that same time span. So here it is, Detroit's chance to be 6-23 overall, going back fourteen seasons. Green Bay's road trip doesn't get any easier, as the team heads to Chicago on September 28. Will Julius Peppers sack his old teammate time and time again? Will the Packers need another amazing "4th Down Miracle" touchdown pass to seal the game? All we know is that it's going to be exciting football, and it's just a few weeks into the season. Packers tickets for road games are always available. We'll take a look at the next four Packer games in another post. If you are looking for Packers tickets for any of the upcoming home and road games, be sure to check out our site. We have offices in Green Bay and Milwaukee. We're happy to upgrade your tickets as well. Call (800)334-5434 or (414)273-6007.